Our superior quality silver-coated SHP front surface mirror features a very high broadband optical reflection for visible light of > 98% and maintains its high reflectivity up to the infrared. Unlike it is the case with dielectric mirror coatings the reflectivity of our silver coatings is almost independent of the polarization of incident light. 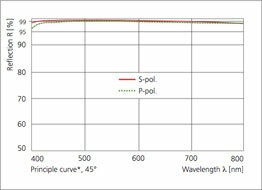 At the same time, silver coated optics can operate at a broader range of incidence angles. Due to the relatively soft coating it usually is not recommended to use a silver-coated front surface mirror in environments exposing them to high mechanical load or abrasion*. But thanks to the thin dielectric coating we deposit as a top layer on the metallic coating of the mirrors they are well protected from oxidation. The high-quality glass substrate we use to make the SHP front surface mirrors keeps distortions low. As a result of their excellent optical properties our high reflection silver-metal mirror have their special place in many optical applications which require broadband high-reflection optical-quality front surface mirror optics. *For applications with increased mechanical exposure we developed our all dielectric SHP-D mirrors which offer similar properties as our SHP. Additional detailed technical information on the SHP mirrors is available on request. We also make other metallic front surface mirrors like enhanced-aluminum, protected-aluminum, or chrome coatings. Also, gold coatings are possible on a batch basis per inquiry. All given details and specifications are mean reference values and are not guaranteed. Also, please consider our "Notes on technical specifications".